One of the modern miracles of retail is the ability to get the right merchandise, in high volume, and across vast distances, either into point-of-sale locations or the customer’s doorstep within a matter of days, if not hours. Enter the distribution center: often an enormous building with hundreds of employees, conveyer belts, thousands of shelves of merchandise and special handling equipment. These centers are the nodes in a web that span continents or the globe for many brands we all know. Several large brands are using security entrances combined with access control systems and cameras at their distribution centers in a certain way to mitigate the risks endemic to distribution center security. Let’s take a closer look. Distribution centers on any given day contain millions of dollars’ worth of merchandise and typically have a very large footprint or hundreds of thousands of square feet. They also operate 24/7. Ideally, they are near an airport or highway system, and in a location with access to a ready supply of economical labor. All of these needs imply an urban location with relatively lower real estate costs. Distribution centers can also experience relatively high turnover in labor and seasonal/temporary workers to handle increases in demand of goods during holidays. Given all of these factors, there are three risks that a physical security plan should seek to address proactively using distribution center security entrances. Theft. The first and most obvious risk, of course, is theft. Relatively low wages and high-value merchandise present the constant pressure of temptation, with targets being small valuables, electronics or even food that can be hidden into clothing. Violence. The second risk is violence, often originating from the employee population. There can be domestic violence in the workplace (a jilted boyfriend or husband seeking out a partner inside the facility) or ex-employees seeking retribution after being terminated. A violent event can disrupt continuity; you will have distraught employees and managers in the aftermath needing support. If the facility becomes a crime scene under investigation, you could have a shutdown of operations costing millions of dollars a day and negatively impacting loyal customers. Bad PR. The last major risk worth mentioning is the bad PR that can result from violence. All too often, we see companies from all types of verticals getting an unwanted spotlight from shootings, smart mobs, protests and domestic violence entering the workplace. Companies with distribution centers are not immune: just a few years ago, a well-known package delivery company experienced a shooting where several employees and guards were injured and killed. This made the news for weeks during the investigation, with pressure on the company to answer questions from the media. Top management wants answers and a management plan. It’s better to learn from the news now than be in the news tomorrow. 4) In general, create a safe environment and a culture of safety and security among the employee population. Distribution centers are in many ways similar to the sterile concourses of today’s airports. (Some of these similarities will be addressed later in the post.) But one of the most important reasons that security entrances are being deployed today is to accurately control and monitor who is in the building, when are they in the building, and what they have on their person at all times. Only security entrances can control the passage of people through mitigating tailgating or piggybacking. Look at some best practices some of the biggest brands are deploying today: a combination of security entrances with manpower and technology to address the most prevalent risks. The Perimeter. The fenceline perimeter should discourage casual infiltration from non-employees. Since higher security practices exist inside the building, the goal at the fenceline is to primarily deter and potentially respond if an incident occurs. Typically, a tall fence is deployed with guarded entrance gates for certain vehicles (security, management, and freight). Cameras are used to record any activities along the fenceline that may occur so they can be reported or investigated after the fact. If there is parking for employees outside the fenceline, full height turnstiles are placed on the fenceline so that employees can use their credentials to unlock the turnstile and enter one at a time into the secure area. Initial Entry, Divestment and Screening. As employees enter the building, they can divest their personal belongings, such as bags, purses, metal objects, phones, keys, etc. into lockers. Some facilities allow phones or keys inside the secure area. 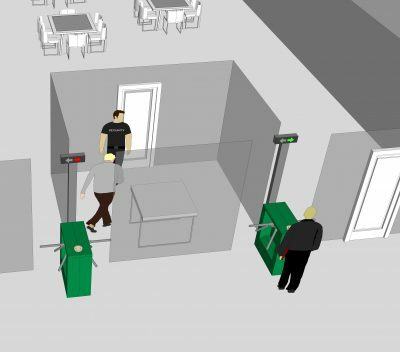 Then, employees approach a manned booth or window to pass any allowed metal belongings into a bowl to a guard who will give them to the employee on the secure side. To enter the secure side, employees present their credentials to the access control system, walk through a metal detector doorway and a full-height turnstile. The turnstile unlocks when the credentials are valid; however it will re-lock if the detector senses a metal object. In that case, the user must back up, remove the object (put in their locker or give to the guard) and try again. The passageway and the turnstile display a red or green light to the user, telling them if they can proceed into the facility or clear the passageway and try again. Employees enter a distribution center by badging credentials, passing through a metal detector, then a one-way full height turnstile. The area is manned in case of non-compliance. Tracking Breaks and Lunches. When employees take a break or lunch during their shift, they can proceed to a snack/concession area with seating so they can eat and relax. To enter the concession area, they pass through waist-high, tripod turnstiles using their access control credentials. This setup enables data to be collected on who is on the floor or off the floor (in case of an incident) and for how long (in case of slippage). End-of-Shift Theft Deterrence. The end of the shift is the prime opportunity to squelch theft. Some companies are using a technique used in airports on passengers: random pat-downs or scans with a wand. Employees must approach an array of two waist-high turnstiles: one turnstile leads to an exit and the other to a search/pat down area with a guard. The employee presses a button that initiates a program that randomly turns on a green or red light. If the light is red, the “exit” turnstile remains locked and the “search” turnstile unlocks; the user must proceed through to get a pat down or scan with a wand. 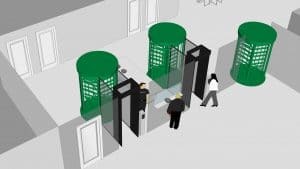 If the light is green, the “exit” turnstile unlocks and the employee can pass through the other tripod turnstile and proceed to exit. All exiting employees, whether patted down or not, proceed through a final, full-height turnstile to exit the floor. The turnstile is configured as a one-way turnstile to prevent “backflow” into the secure area and also enable the access control system to keep track of who has left the secure area for the day in case of any incidents. The employees can then access their initial divestment area, access their lockers, and exit the building. The process described in this post uses security entrances that are relatively inexpensive and ideal for deterring theft or other unwanted behaviors. If you have a big rollout at multiple locations and a limited budget, this approach can be a great fit. If you manage a single location or can invest more up front, you can increase the ROI further by deploying a security revolving door instead of a full-height turnstile. The security revolving door uses sensor technology in the ceiling to scan compartments and outright prevent attempts at tailgating or piggybacking (two people sharing a compartment together); this means you can cut down on a guard at that entrance a create a payback in less than a year. As you can see, security entrances work in conjunction with guards and technology at distribution centers to add an essential layer to a distribution center’s physical security plan. You can leave far less to chance or error compared to using just guards alone or swinging doors and access control. You can effectively deter and control access to the secure facility, track who is in the building 24/7, and minimize theft. In the end, security entrances enable an overall distribution center security plan that ensures maximized safety and risk mitigation. When leaving work for the day, employees press a button and a random program indicates whether they must undergo a random pat-down search or can exit freely via one-way turnstiles.